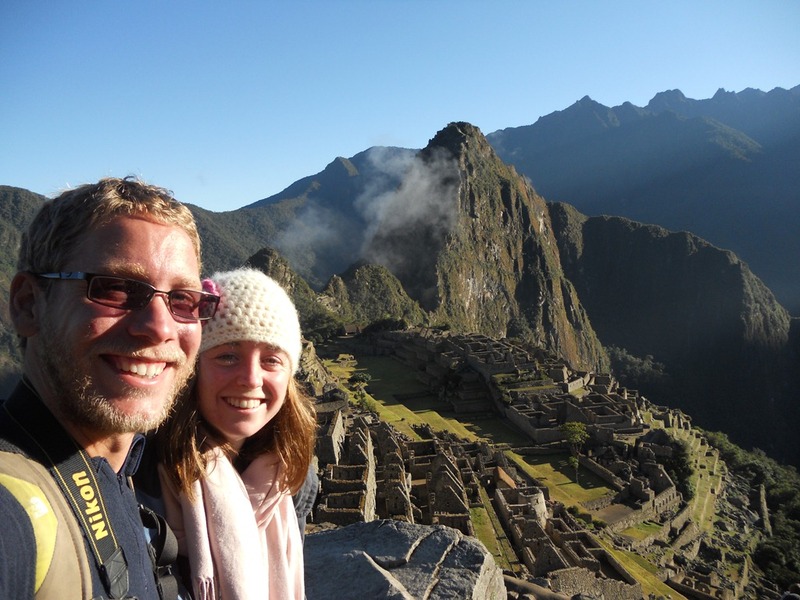 In the searches for my blog “Machu Picchu” is often something that brings people here because I’ve mentioned it a couple of times but I’ve never really wrote a full blog about my Machu Picchu experience. 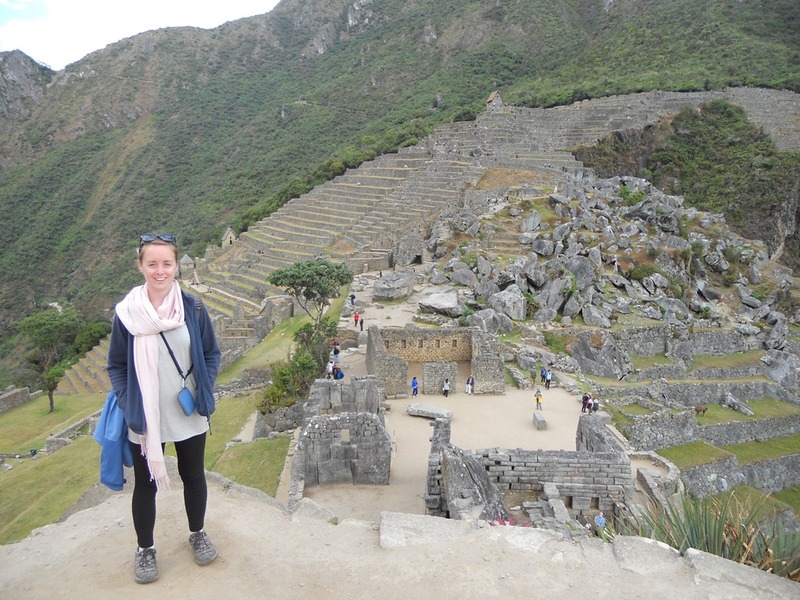 So, I thought I best get on with it and share the incredible day I had at Machu Picchu because it was one of the best days I had in the whole of my South American trip. 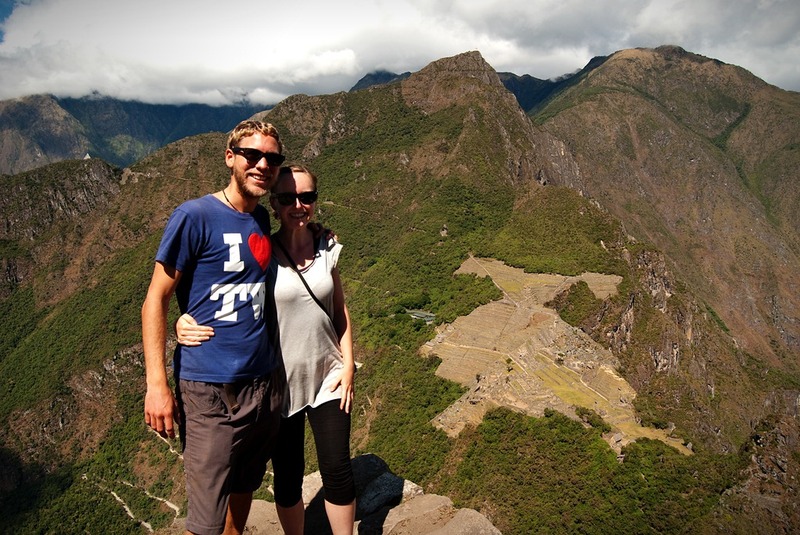 We did it we made it to possibly the most famous and most talked about site in South America MACHU PICCHU!!!! 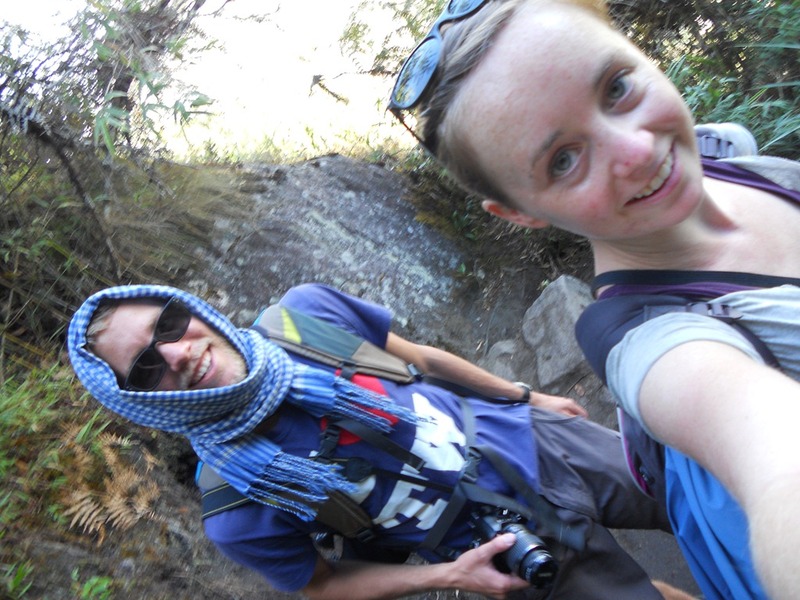 Me and my travelling partner in crime Tom, had always planned to walk the Inca Trail to Machu Picchu but unfortunately the official Inca Trail (a four day hike to the ruins) was fully booked until September 2011 (we were there in June 2011, it gets booked up fast). 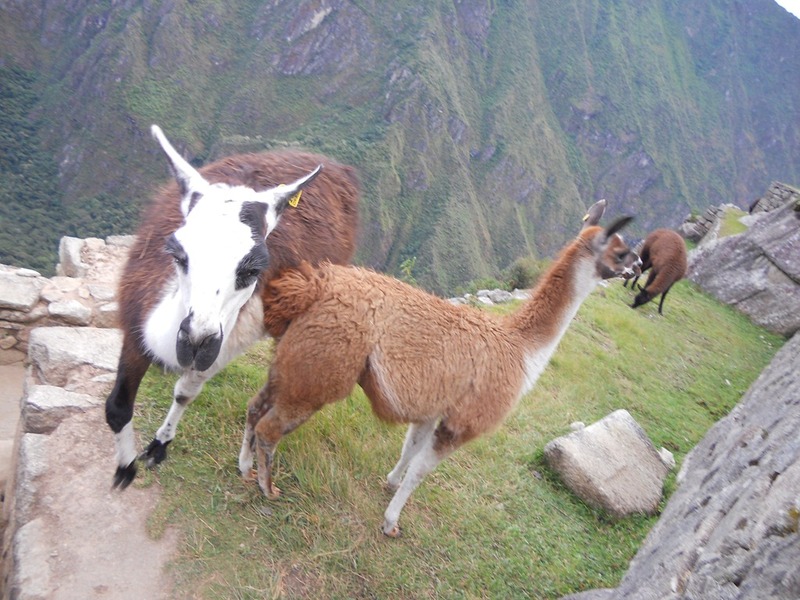 Decisions, decisions, what should we do if we didn’t walk the Inca trail? 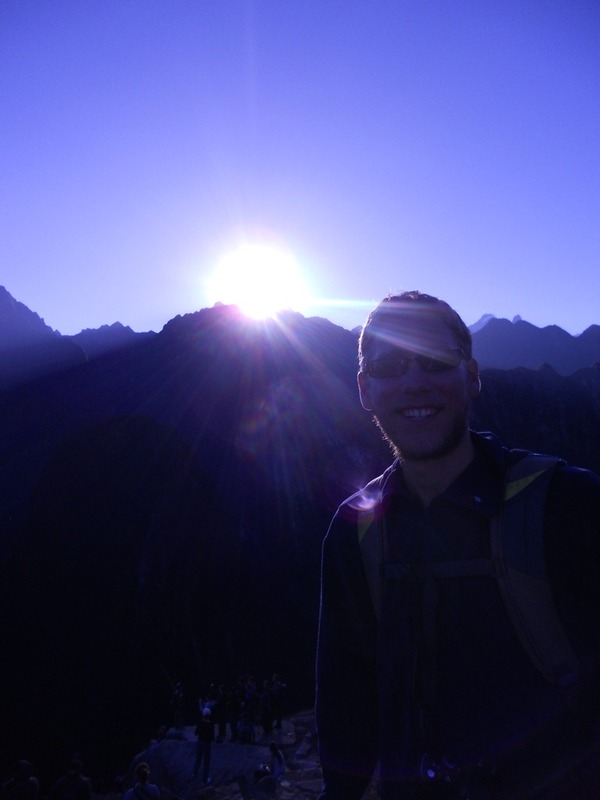 There are many great alternative trails which you can do including the Salkantay Trail which we had heard positive things about. 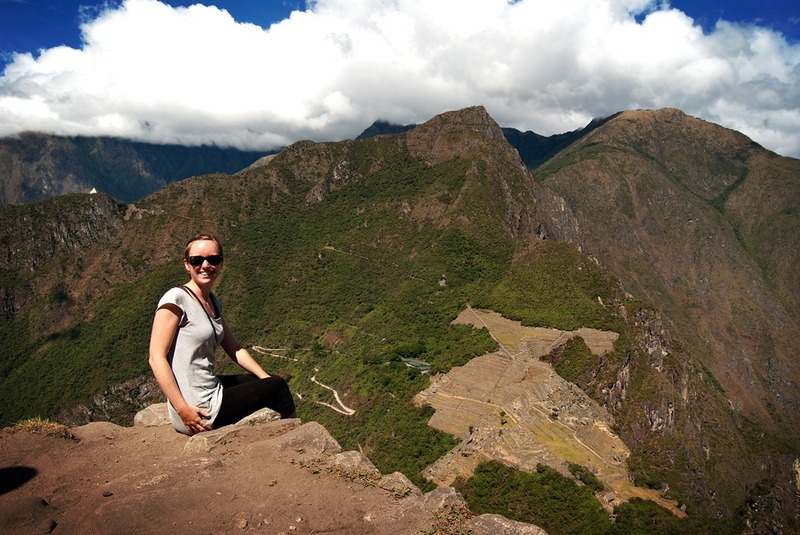 You trip lasts for five days, four nights taking in some great sites and heights (4600m!). 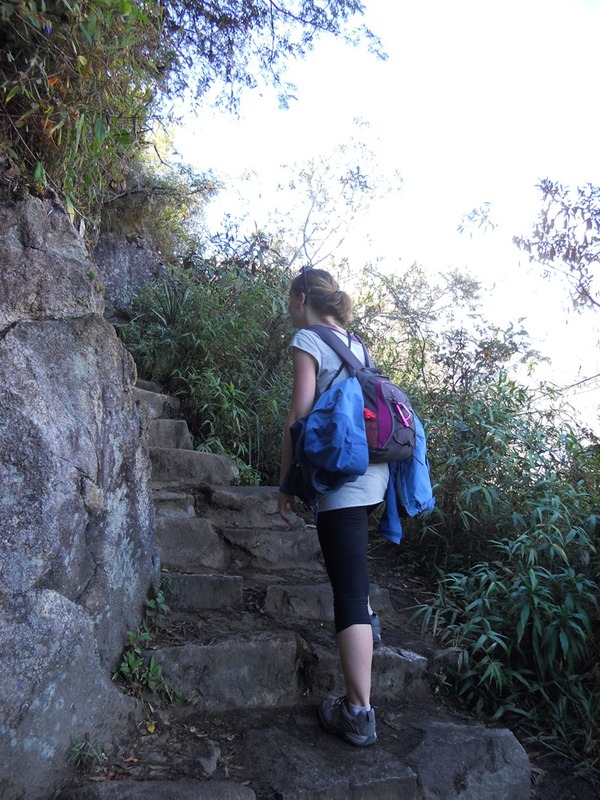 However despite the interesting hikes none of them let you walk along the Inca Trail which actually brings you right into the ruins of Machu Picchu. 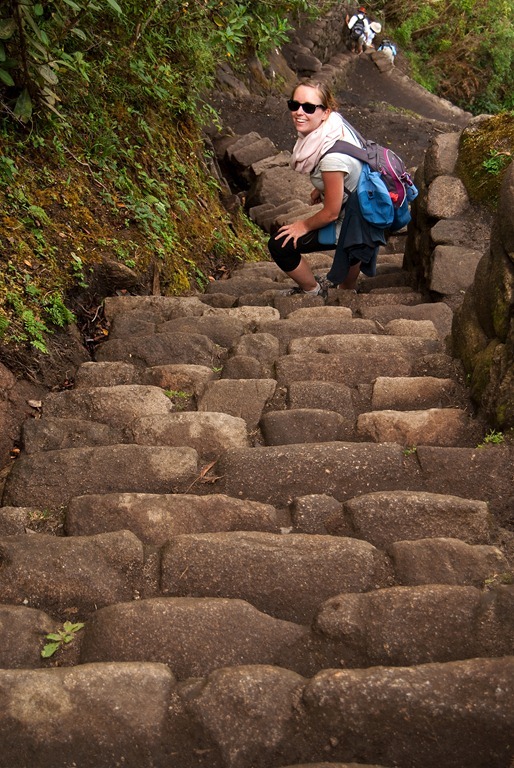 On all of the alternative trails you stay your final night in Aguas Calientes (the town below Machu Picchu) and then the next morning you can get the bus or walk up the steps to Machu Picchu with everyone else. 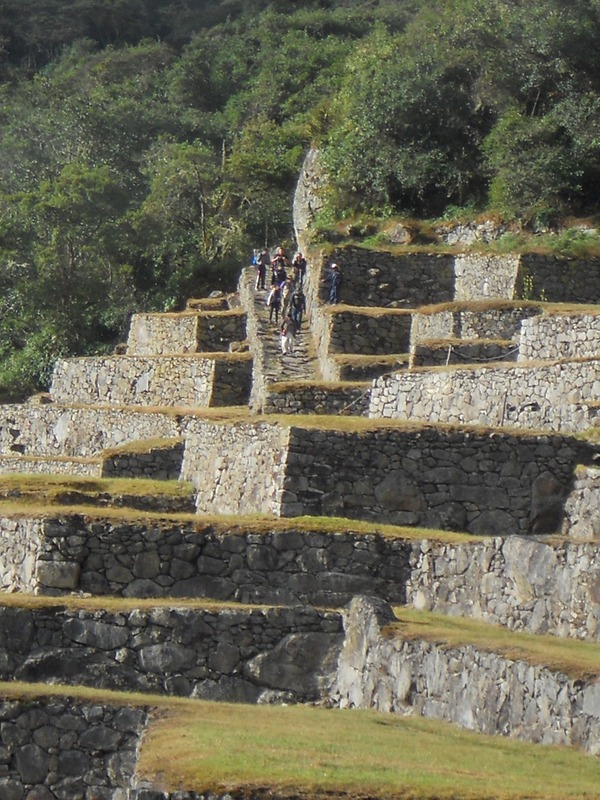 Also to do any of the Machu Picchu hikes you have to do it with a tour group and because of this you can normally only spend about 3 hours in Machu Picchu (after walking 5 days solid to get there this seemed pretty RUBBISH and not for us). Therefore we decided if we couldn’t do the actual Inca trail we wouldn’t do a hike. 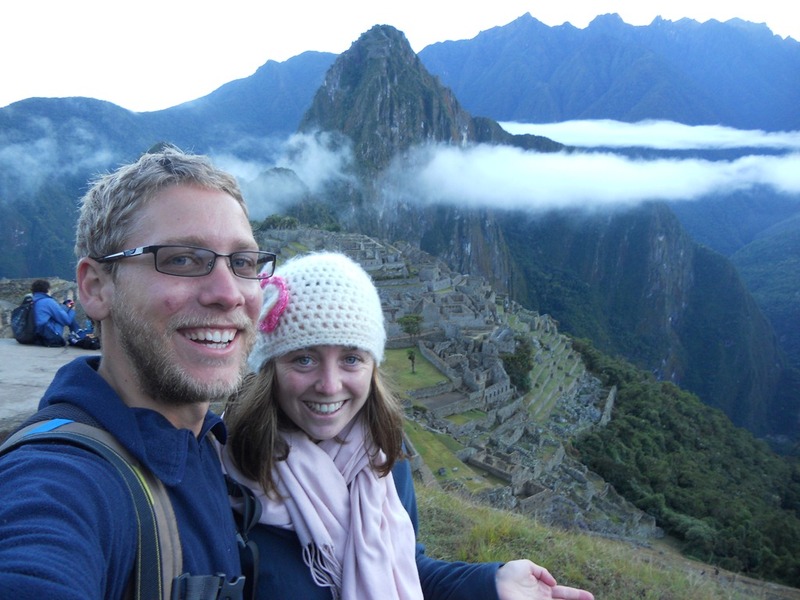 Even though the hikes sounded fine, what did we want more, an incredible hike or an incredible full day at Machu Picchu? So, we didn’t go on a tour, we did it ourselves. 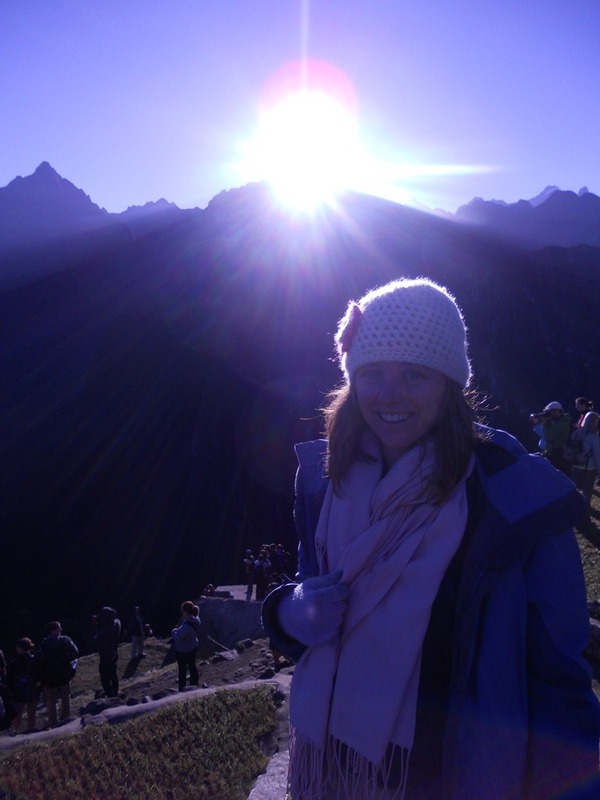 The day was incredible, we walked up to Machu Picchu in the dark, before sunrise, so that we could get Wayna Picchu tickets. Now that was NOT as easy and as straight forward as it sounds. On our way to join the queue at 4.15AM!!! 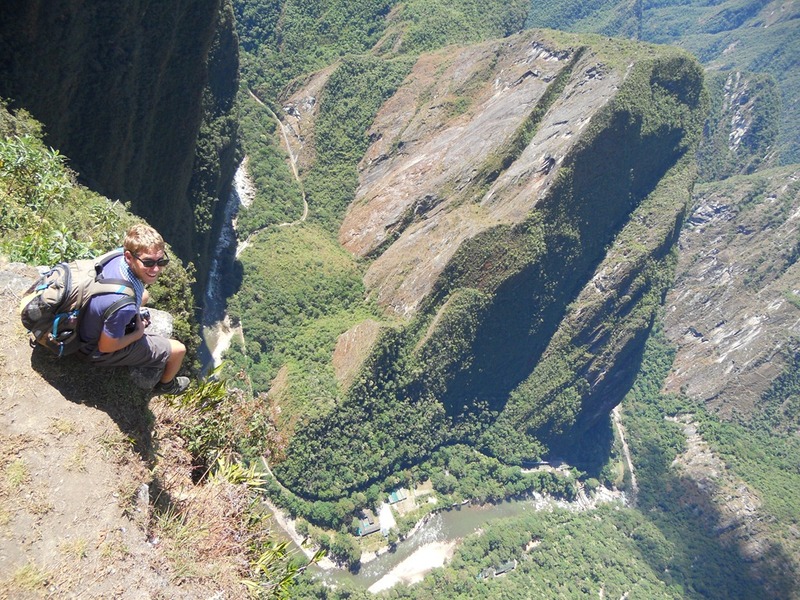 Only 400 people a day are allowed to climb Wayna Picchu and view Machu Picchu from it. 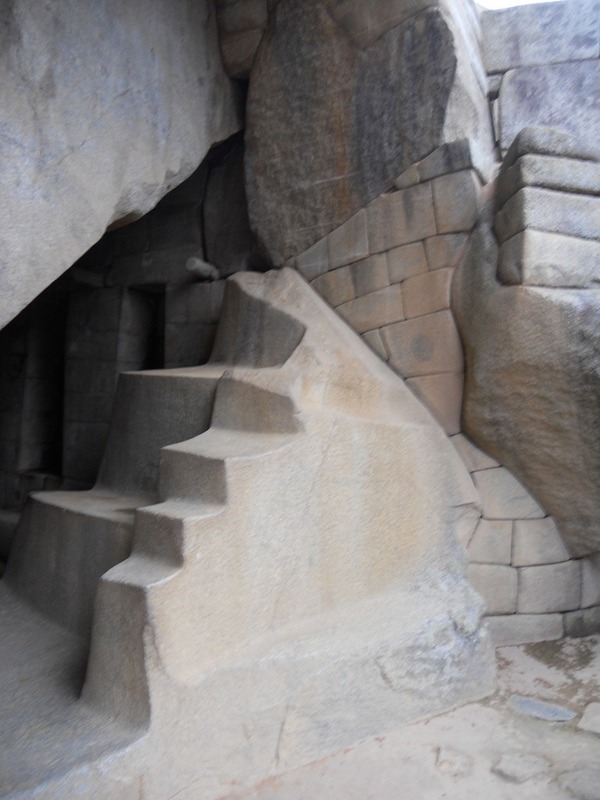 To get a ticket you have to climb up the steps to the Machu Picchu entrance early in the morning to be in with a chance of getting a Wayna Picchu ticket (and that’s a lot of steps). The bus road doesn’t open until much later so if you take the bus, there is a huge risk that you might not get a Wayna Picchu ticket because the majority of people walk up earlier. 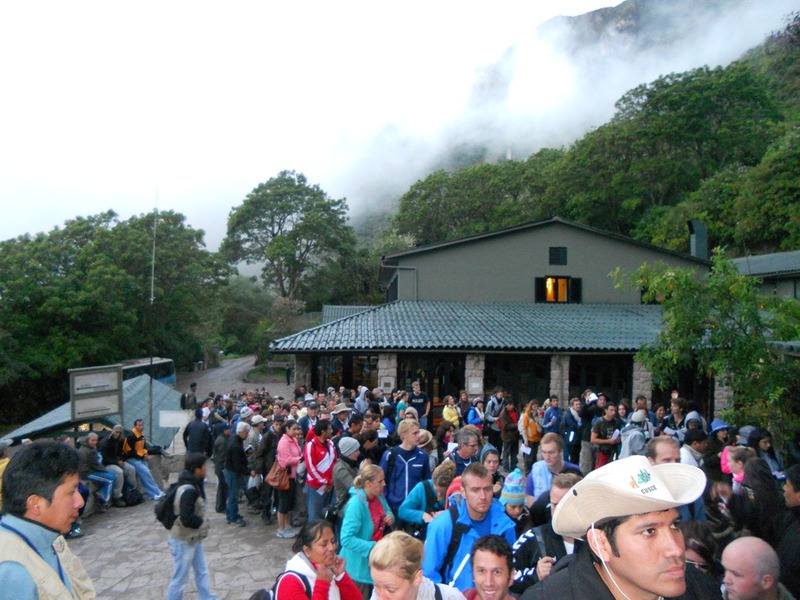 The queue of people waiting for the trail up to the Machu Picchu entrance to open. Already lots of people waiting at 4.30am! To do this walk we got up at 3.30AM!!!! Luckily we went to bed at 7pm so we felt good. As I was getting dressed I peaked out of the window and I could already see other people walking to join the queue, this made me panic and hurry up a lot! We left our hostel at 4.15am to race to join the queue at the bottom of the hill which would eventually lead us to Machu Picchu. 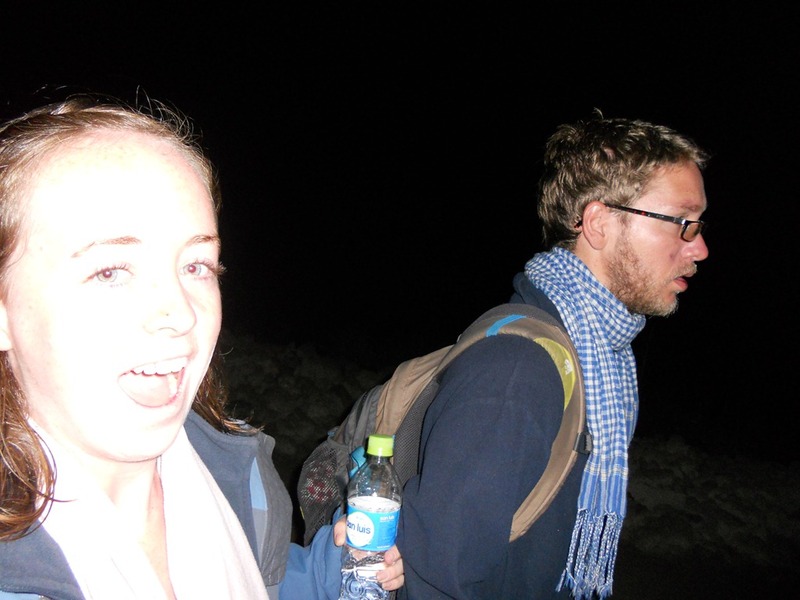 The route up to Machu Picchu is not lit so we had head torches on. Once we reached the tail end of the queue at 4.30am there must have been about 100 people queuing already!!! It was INSANE! 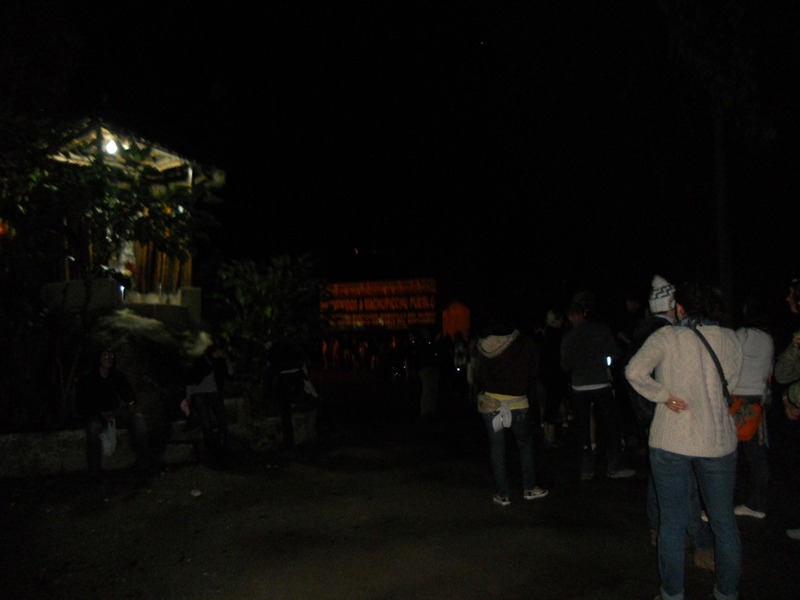 At 4.30am the guard checked that you had a ticket for Machu Picchu and then let everyone up the steps. Now this walk was horrible, I hated it, at 4.30am people literally raced up this vertical hill side, pushing and shoving and sweating a lot. 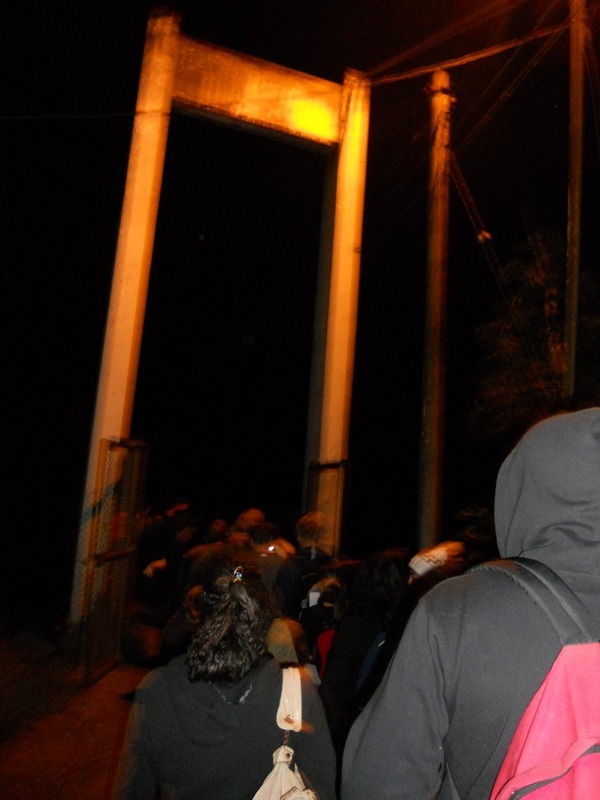 It was pitch black, the steps are small Inca stone steps so it was a single file line up 100s and 100s and 100s of steps………..if you stop for a break 50 people will pass you so that’s 50 people in front of you more likely to get a ticket. SO you can’t stop. I was absolutely dripping with sweat and my legs were shaking from walking so fast without a break. Tom practically dragged me nearer the top because I was really struggling. Anyway, everyone was going up the steps in single file, some people were running, other people were just walking, I let people overtake me because I knew they were faster than me and I wasn’t going to challenge them because it wouldn’t have been fair. If they were faster then they were faster. An American guy started arguing (whilst still walking, everyone was in silence at this point because it was painful and 4.30am!!) because some people tried to overtake him. He started shouting, “No-one’s getting passed me today, no way am I letting people overtake me.” He even stuck out his arms to stop them, it was really pathetic. His American girlfriend started arguing with him that he was embarrassing himself. After about an hour of intense uphill walking (I’m really not making this up), at 5.30am we made it to the top. I could have cried with exhaustion, I was wet through, but as soon as I stopped walking it got really cold so I was freezing. The queue at the top, waiting for the ticket office to open. It was still dark as the sun had not risen yet. Everybody was very hot and sweaty after the race up the steps! Then there was more chaos at the top of the mountain. At the actual Machu Picchu entrance it was not like England, there were no queuing ropes or barriers so everybody charged to the front pushing. This was now pretty irritating because we’d made it to the top, it wasn’t a race anymore, the place you arrived in should be your set place in the queue. Masses of people waiting to see if they were quick enough to get a Wayna Picchu ticket. 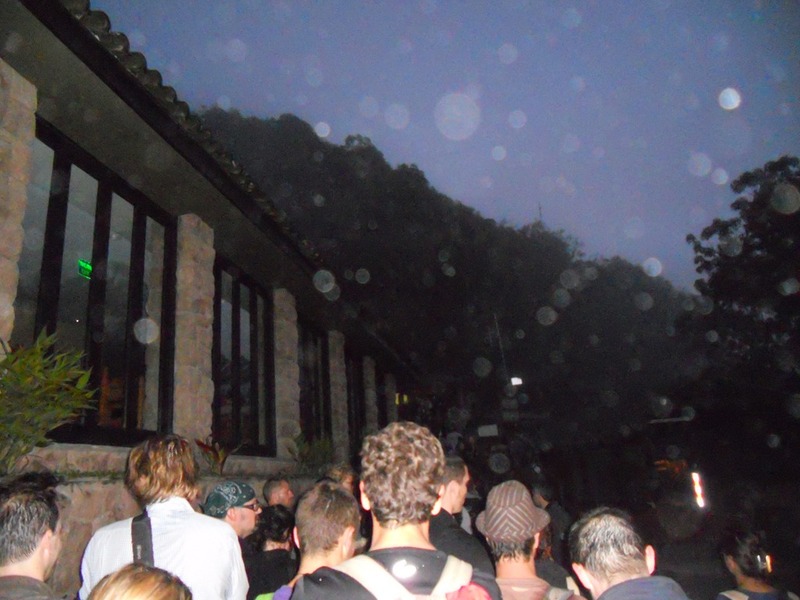 At 6am the Machu Picchu entrance and Wayna Picchu ticket office opened and we got to find out if we were within the first 400 people to make it to the ticket office………….and YEAH we were!!!! 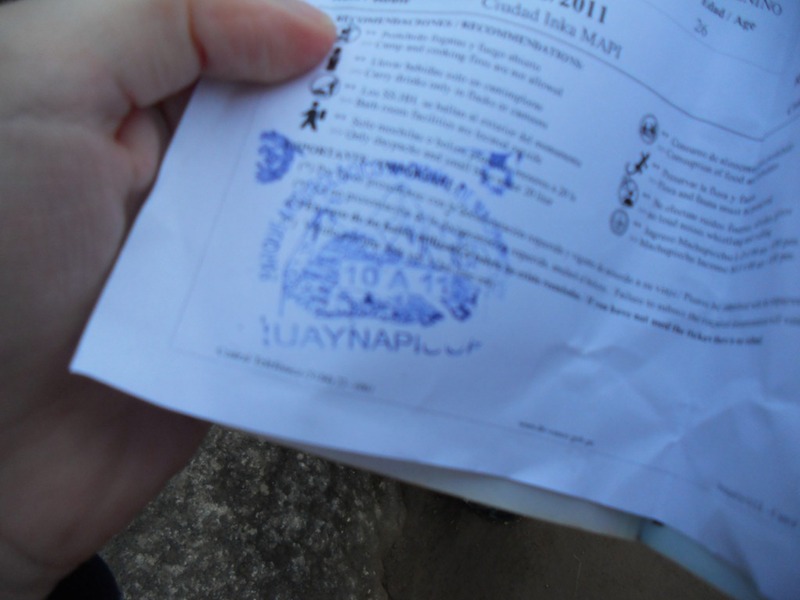 We were actually in the first 200 people up the mountain, so we got given a ticket to climb Wayna Picchu Mountain at 10am. It was really, really exciting. I was incredibly scared after all the intense walking that we still wouldn’t have made it in time to get a ticket but thankfully we did. 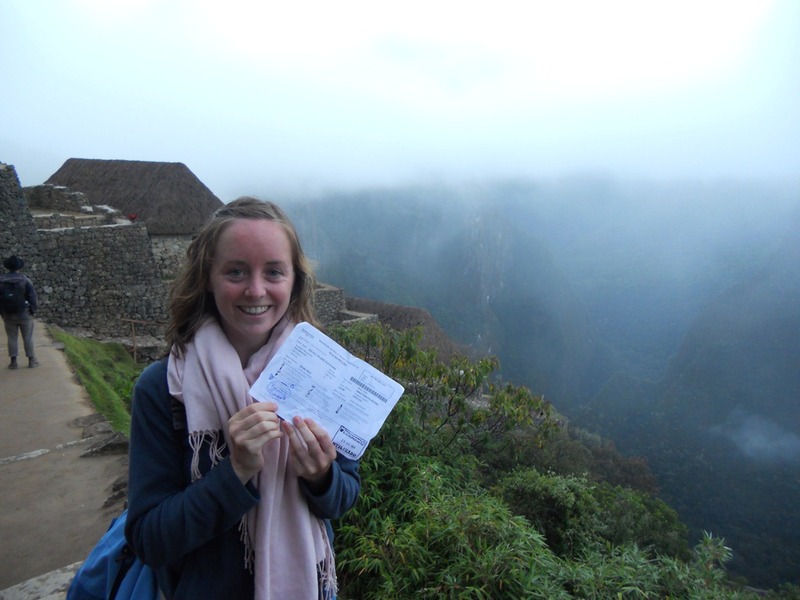 Wooohooo we got Wayna Picchu tickets! 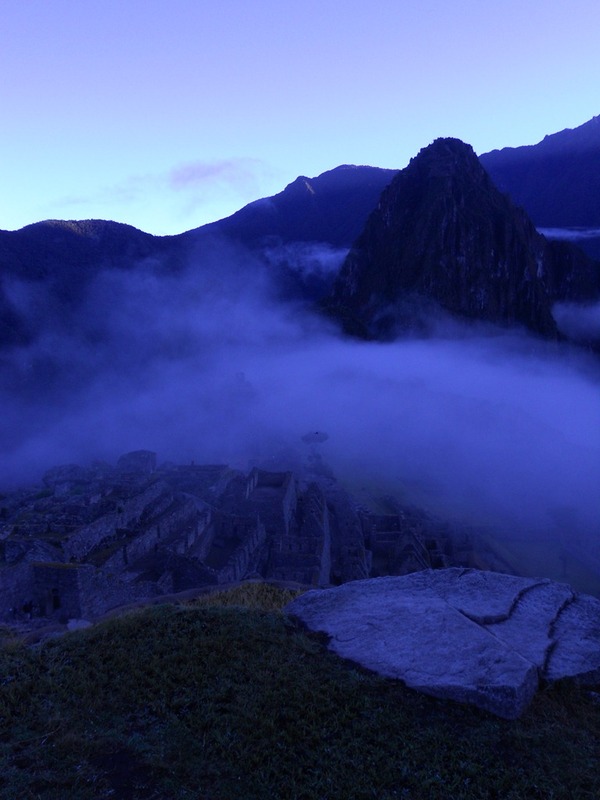 This was before sunrise when Machu Picchu was still lost in the mist. 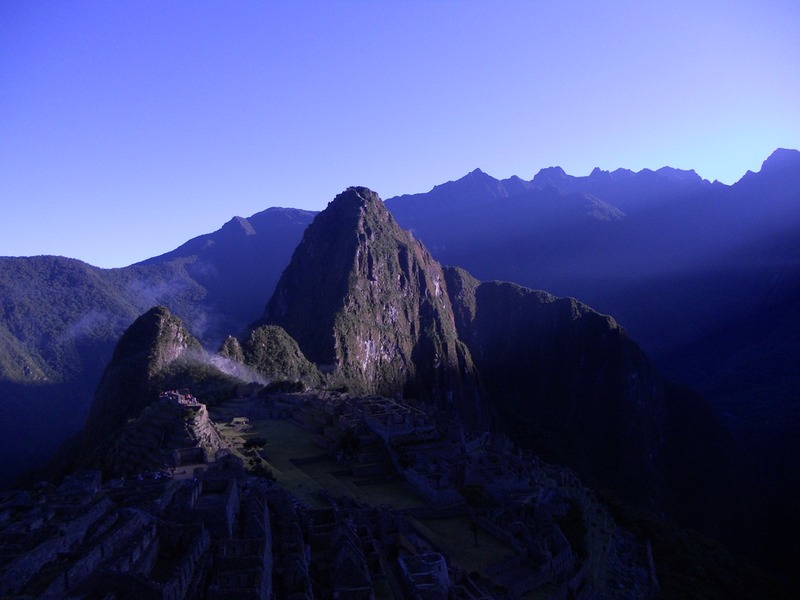 After getting our Wayna Picchu tickets we could finally relax and watch the amazing sunrise over the ruins, this was brilliant, a spine-tingling moment! The ruins appeared out of the mist and into a sunny, blue sky. WOW. This was really one of the best things I’ve ever seen. It seemed spooky at first, the way it was there one minute and not the next. As it was sunrise no tour groups were there and only a few hikers made it along the Inca Trail in time, so it felt like we had this enormous site to ourselves, pure bliss. 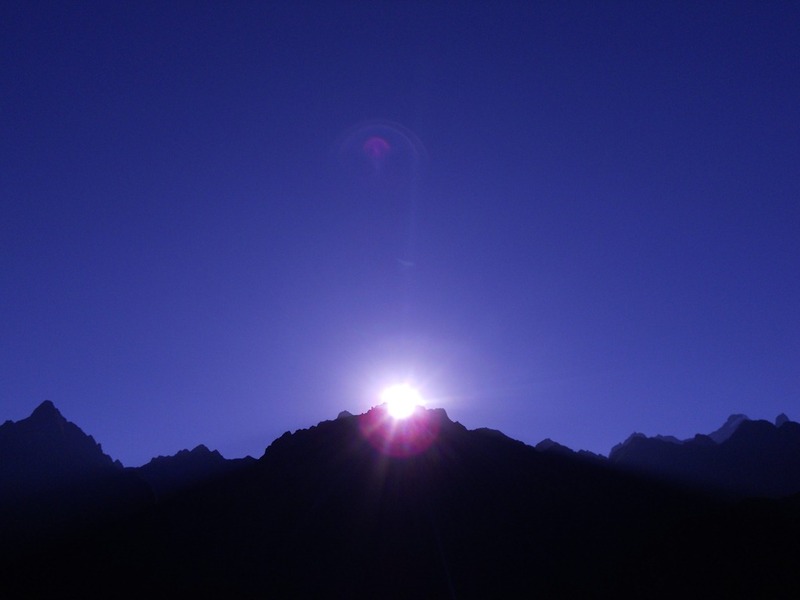 Watching sunrise over Machu Picchu. It was incredible to see the ruins appear out of the mist. We chilled out for a while until 10am. 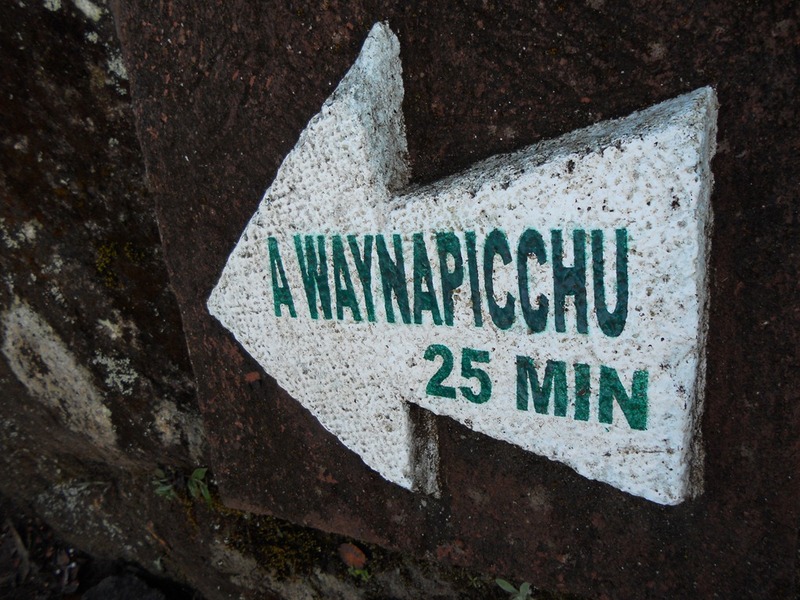 Then we climbed Wayna Picchu, which again was a lot of uphill steps but this time it was better because there was no race or time limit so we could take our time. 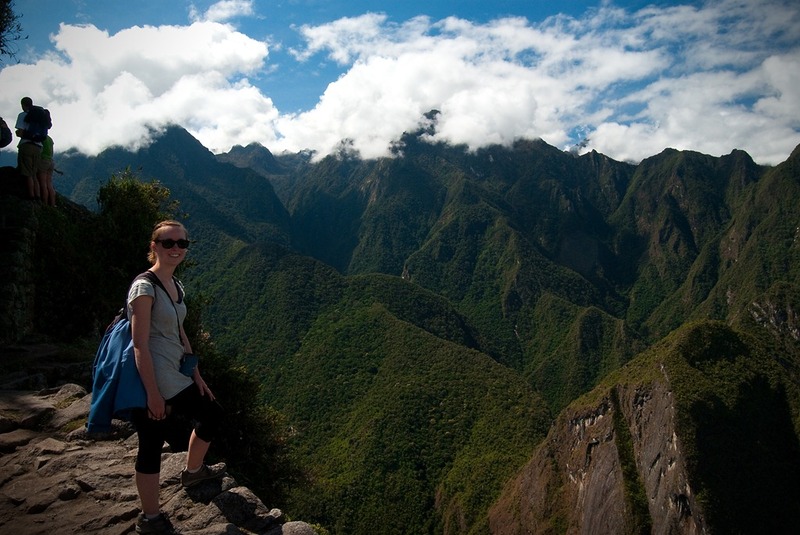 Walking up another steep hill to Wayna Picchu, hot work but worth it! 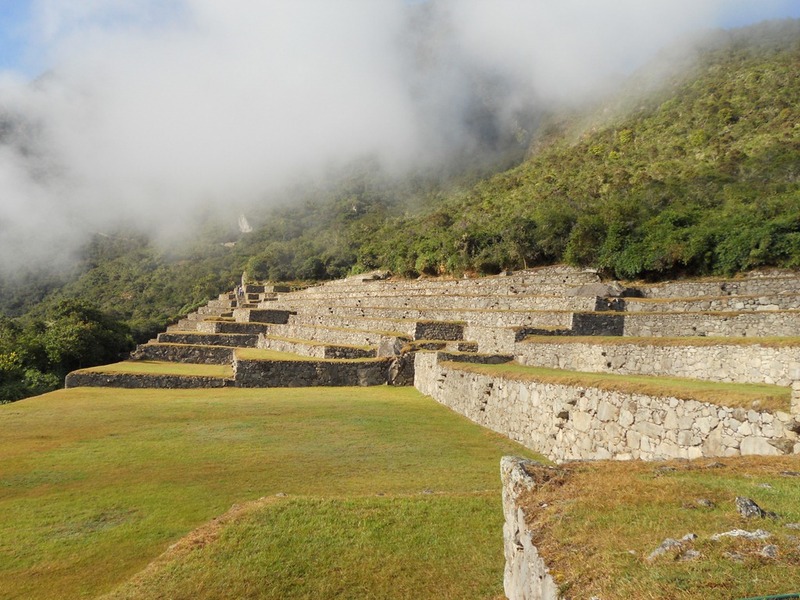 The experience of Wayna Picchu was my favourite one of the day, it really was worth the horrendous climb up the hill at 4am in the morning to get the tickets. From the top of Wayna Picchu you get a tremendous view back down onto Machu Picchu and the surrounding valley from really, really high up. 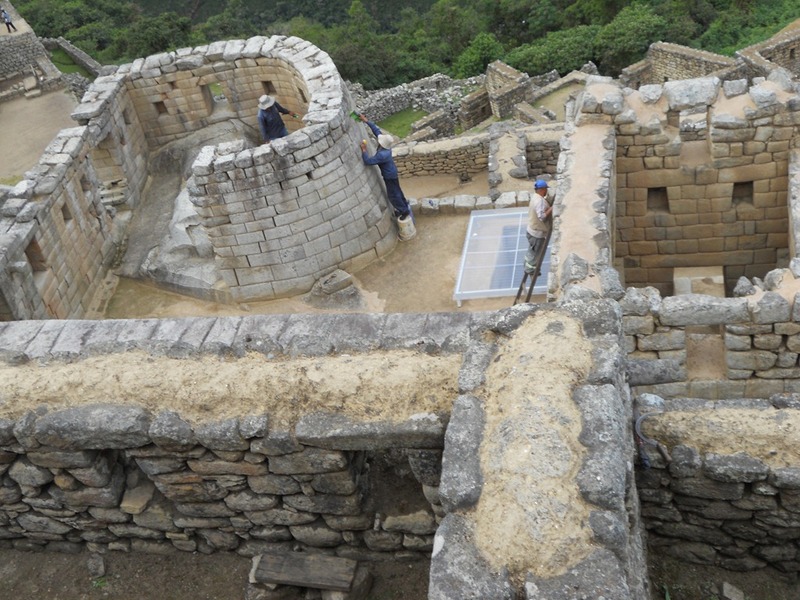 Also there are some very good ruins on the top of Wayna Picchu, which you can’t see from the ground so that was a nice surprise. We took lots of pictures from the top as the sky was blue and it was really beautiful. We had a picnic on a garden terrace right at the very, very top (it really is high, your knees will wobble). This has to be my all time favourite picnic spot. What an experience being in the 400 people who got to go up there when there were thousands of people milling round Machu Picchu below. 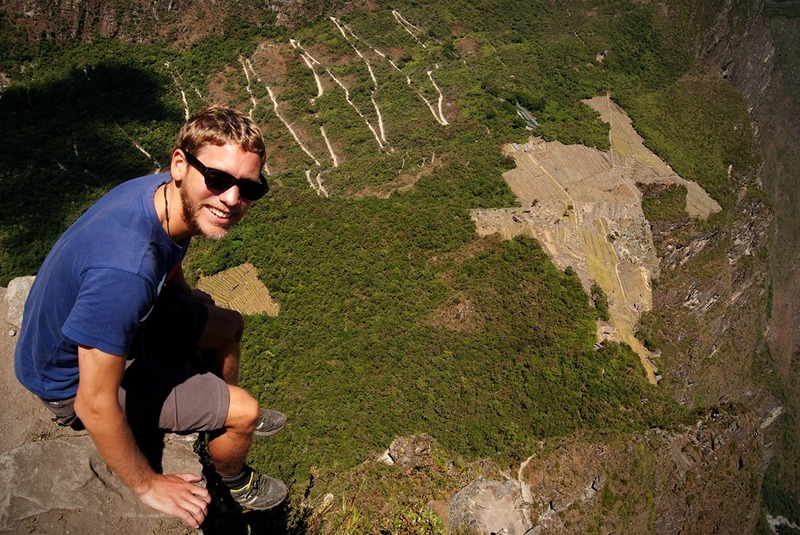 The spectacular views from Wayna Picchu looking back over the ruins of Machu Picchu and the windy road up to the ruins. 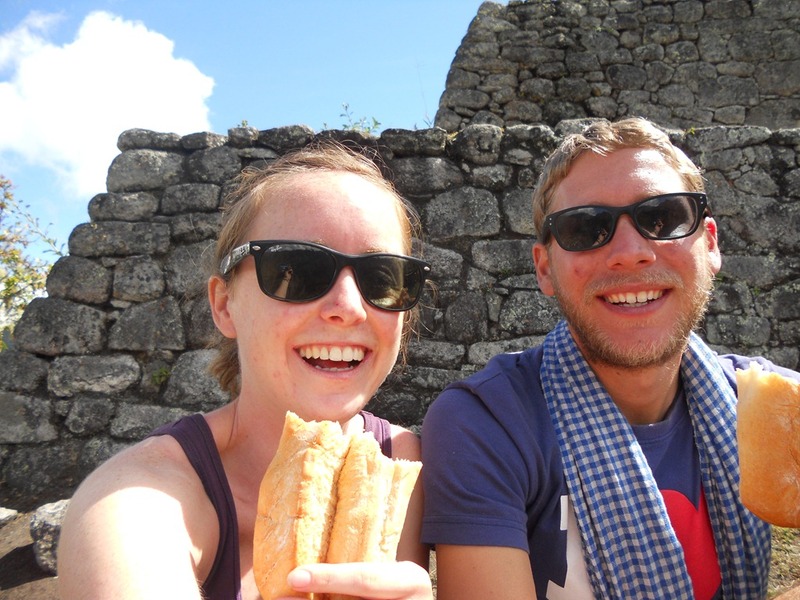 After we climbed down from Wayna Picchu we spent the rest of the day wandering around all of the ruins. We didn’t want a guide so the night before we wrote down all the must-see spots and we did our own tour of them. 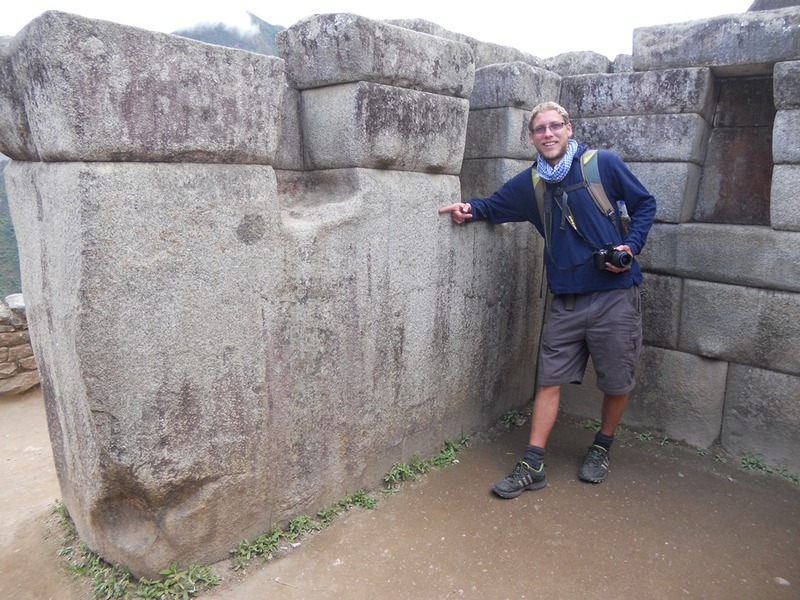 Unfortunately, as you know, there is just so much to see that the site closed before we had made it up Machu Picchu Mountain. This was a bit of a shame as apparently it’s another great viewing spot, although I don’t think my legs could have taken another climb! The ruins were wonderful to wander around, you could get lost amongst them they seemed endless. In total from waking up very early in the morning, to getting back to our hostel at night we spent eleven hours in and around Machu Picchu. Despite this I still felt like I could have gone back for more. 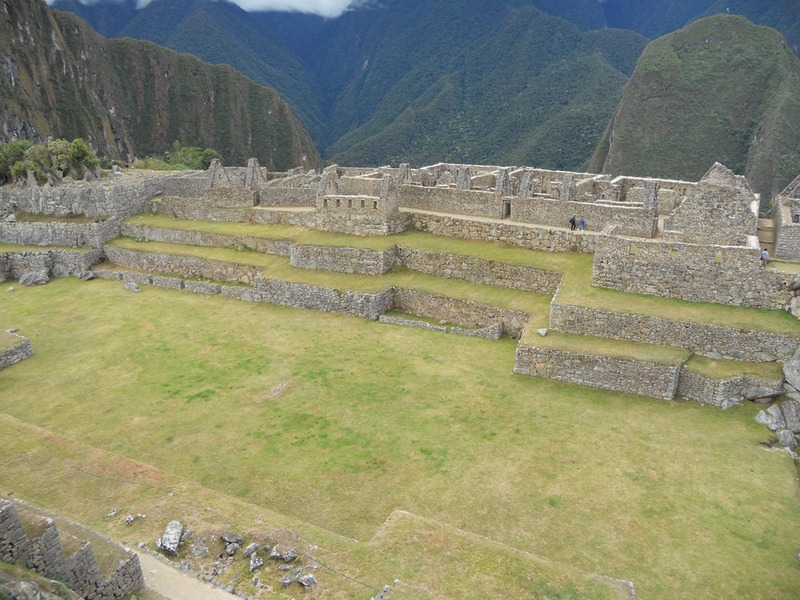 I found Machu Picchu to be truly phenomenal, all the positive adjectives in the world wouldn’t be enough to express my love of my day at those ruins. 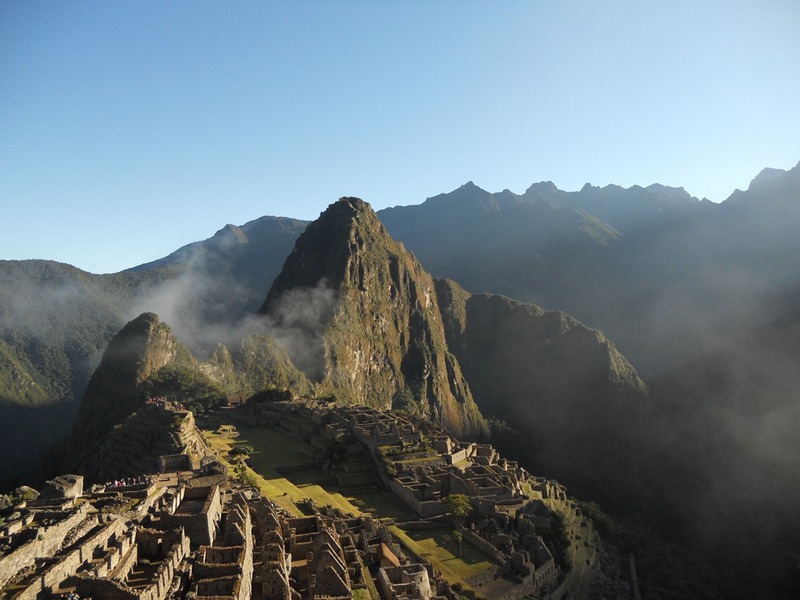 It really is a magical place, it has to be on your bucket list BUT make sure you get Wayna Picchu tickets and don’t forget to get your passport stamped!!! 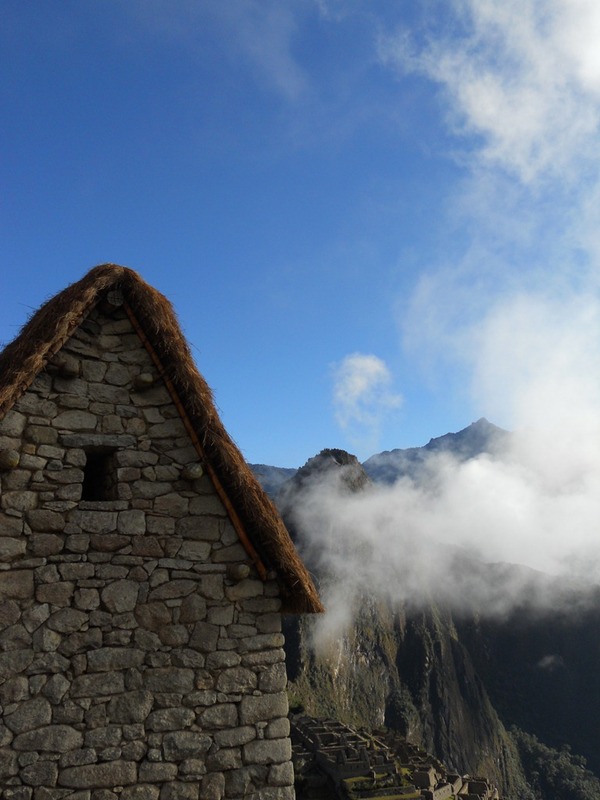 If you want to know how you can get to and from Machu Picchu cheaply, check out this blog post Machu Picchu: Returning to Cusco on the cheap. 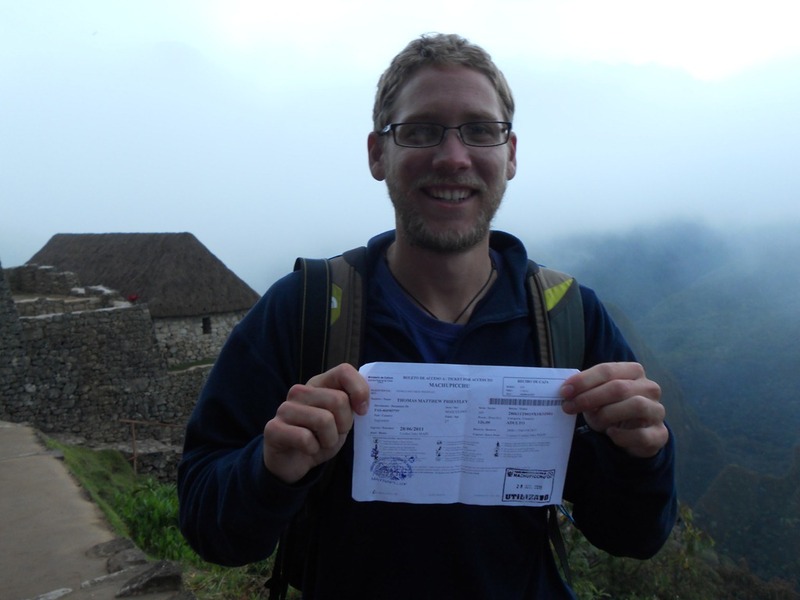 Have a look at this blog if you want to know more about the Cusco Tourist Ticket, Cusco: The Tourist Ticket. Or read one of my previous blog posts about another one of South America’s top spots Lake Titicaca, An Ocean Not a Lake. What and how do you pack? 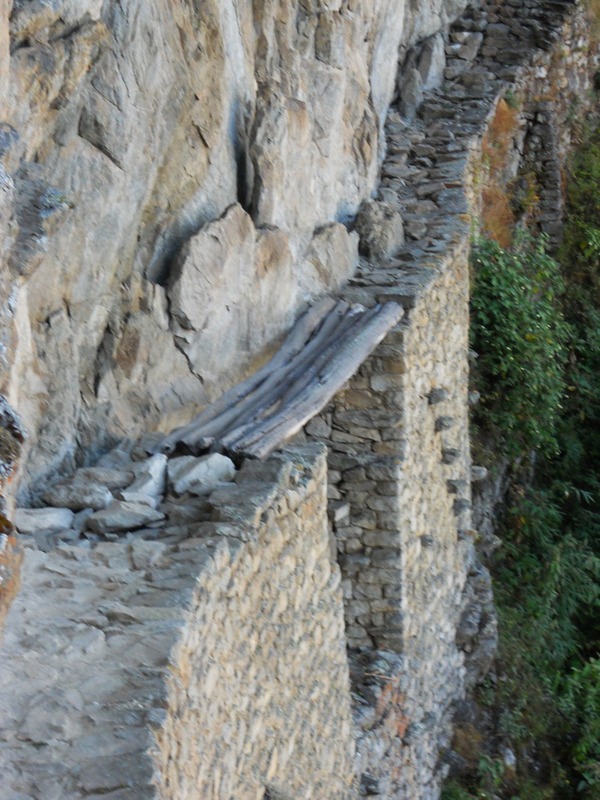 Great blog cant think why Karl Pilkington thought it was just a pile of old stones!!!!! Only thing is I dont think I could do all that to get a ticket for Wayna Pitchu there must be a way of paying someone extra to get you one??? you need to stay at the hotel at the entrance of MP, then you can wake up early but not have to walk and just wait at the front of the queue. No idea how expensive that hotel is though! !